Therapy dogs and their handlers provide a service to others. There are regional and national organizations that test, certify, and register therapy dogs and their handlers. Once certified, they are allowed in hospitals, nursing homes, schools, airports (not airplanes), etc to provide comforting services to others. They do not have special access to businesses, restaurants, etc. These dogs provide emotional support and companionship to their owners. These dogs have no special privileges. Like Companion Dogs, these dogs provide emotional support and companionship to their owners. If the owner has a letter from a health care professional describing a need for such a dog, then the dog can become an Emotional Support Dog as long as the following are met. The letter has to be on the health care professional’s letterhead and must be updated yearly. The dog must be trained to behave in public with both people and other dogs. If these requirements are met, then it is allowed to live in housing that does not normally allow dogs, and it can fly in the cabin on airplanes as long as it meets the requirements of Air Carrier Access Act (ACAA). Like Therapy Dogs, they do not have special access to businesses, restaurants, etc. Service dogs provide a needed service to their owner. They are allowed almost anywhere. Establishments can only ask two questions of the owner of these dogs. Is that a service dog? If so, what service does it provide? The exception to this is that the owner needs to provide the information required by the ACAA in order to fly in the cabin of an airplane. These dogs are not required to wear identifying vests, etc, although this is advised to let others know not to bother the dog as it is in “working mode”. If at any time the dog is misbehaving or disrupting business at the establishment, the dog and its owner can be asked to leave. 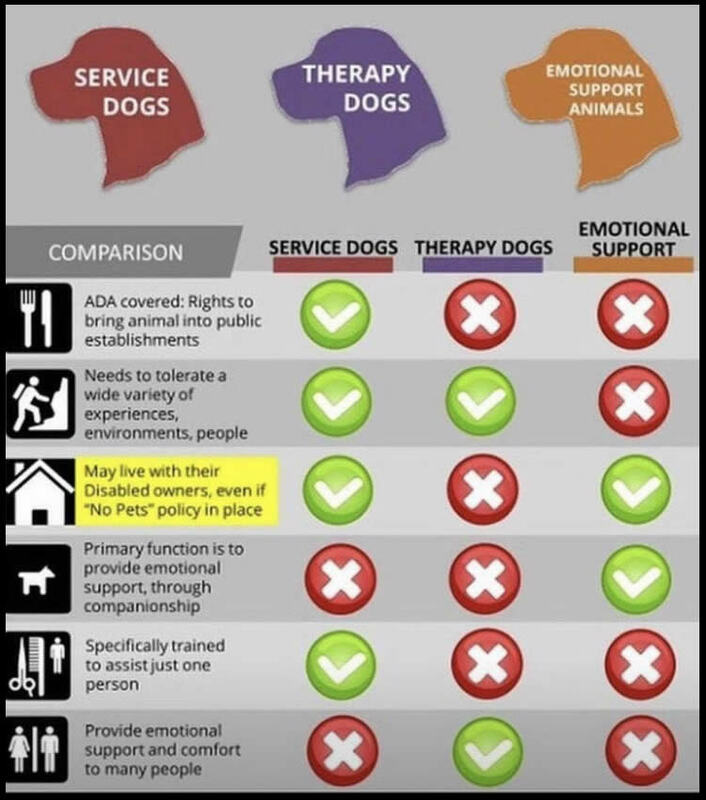 Although the Americans with Disabilities Act (ADA) does not require formal certification of these dogs, many organizations providing trained service dogs require documentation of the of the need from a health care professional. Although not required, all owners of service dogs are advised to have proper documentation of both the need for the dog and its training. This is valuable should an incident arise causing a liability issue. Also, it is illegal to misrepresent a pet/companion dog as a Service Dog. The ADA lists medical needs requiring service dogs. Basically these can be classified as either physical or psychiatric needs. Physical needs can be things like blindness, hearing impaired, balance issues, seizures, diabetes, etc. Psychiatric issues can be things such as PTSD, severe anxiety, autism etc. Dogs used for physical disabilities are usually larger is size due to the nature of their jobs. Certain breeds stand out as the dogs most used for these tasks, however, it is not breed specific and any dog with the right temperament and properly trained can perform the necessary tasks. Dogs used for psychiatric disabilities come in all shapes and sizes. Their temperament and strong desire to bond with the human gives them the unique ability to sense the needs of their owner. Some household pets have developed this ability without training to help their owners with psychiatric issues. Dog selection is critical for a successful match. Not all dogs are suited for this type of work and much of what they do cannot be trained. It just comes natural to them. Training for these dogs usually consists of obedience, socialization, and public access training as the job they perform is inherent to their demeanor and close bond they have with their owner. This training allows them to be comfortable in public so they can focus on the needs of their owner.